Behold! The Renaissance, a time of renewed interest in the worlds of poetry and music, science, philosophy and art. The printing press allowed the ideas of the era to spread far from their native cultures. The Renaissance led to a flowering of music, literature and art, and architecture (1). Buckle up, because this one is a series of scenes that culminates in an animatronic extravaganza! 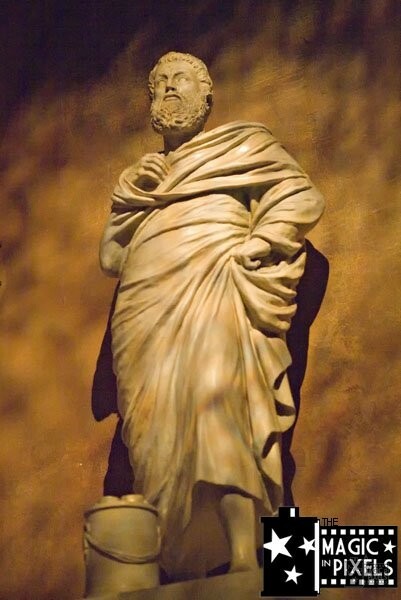 A statue of Sophocles found in Terracina, Italy and is preserved in the Gregorian Museum of Profane Art, in the Vatican. Sophocles, the celebrated writer of tragedy plays in ancient Greece. 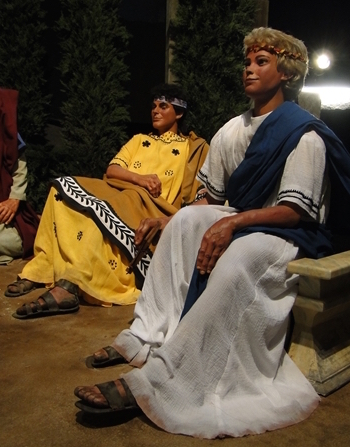 Prior to the 2008 refurbishment it was a play by Sophocles being portrayed in the Ancient Greece Theater scene. He returns again at the start of the Renaissance scene to let us know that we have moved from Gutenberg’s print shop in Germany to Italy and to signify we are psyched about dramas again. The pail next to Sophocles isn’t for park maps, its holding eight scrolls, a reference to his seven extant tragedies and one satyr play (2). The statue was found after the Renaissance south of Florence Italy. Within just a few years, printing presses were being estabslished all over Italy. 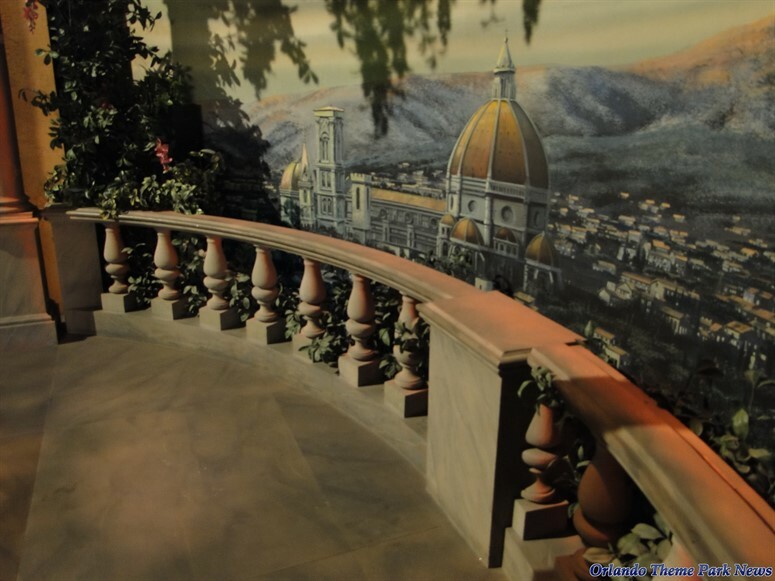 By the end of the 15th Century about 80 towns in Italy had printing presses. Italy was responsible for almost 1/3 of the books published in Europe during this time (3). One city in Italy didn’t do nearly as well as others for print and that city is Florence. 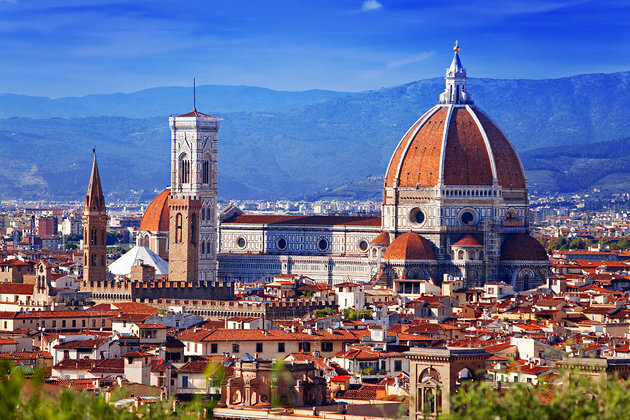 Florence was the “intellectual capital” of the Italian Renaissance as well as a producer of hand written manuscript books. The elite were reluctant to adopt the new, less beautiful means of production from the printing press (3). 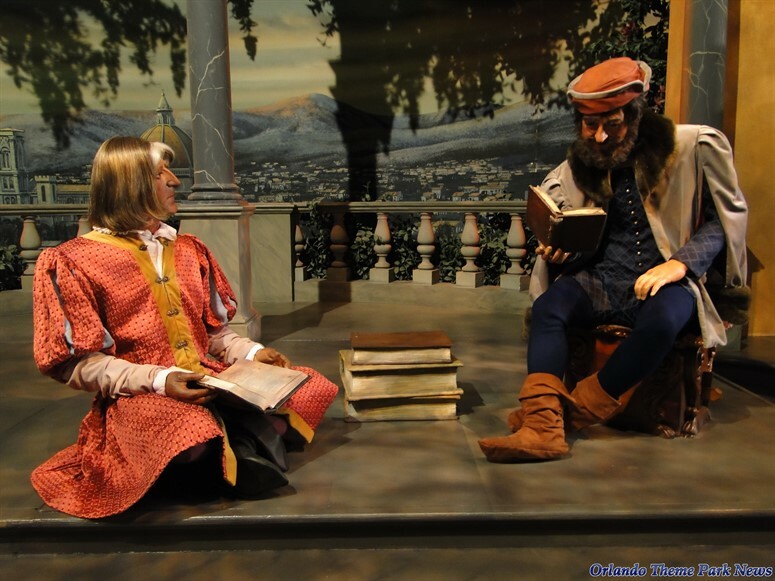 Despite Florence’s resistence to to print at the start, the first characters we see after the statue are two men reading from a pile of books. The gentleman is reading from Virgil’s epic poem Aeneid. They may be poets, philosophers, or scientists but regardless they are dressed in fancy pants! First Renaissance Scene post 2008. Our friend on the left (above) looks an awful lot like future President, Andrew Jackson and a previous press operator from Gutenberg’s press. Perhaps having an inside printer is what warmed these guys up to the idea of mass produced non-elitist texts. 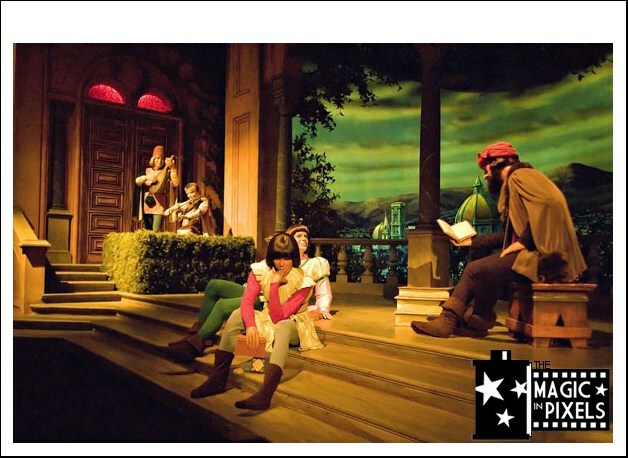 First Renaissance Scene pre 2008. 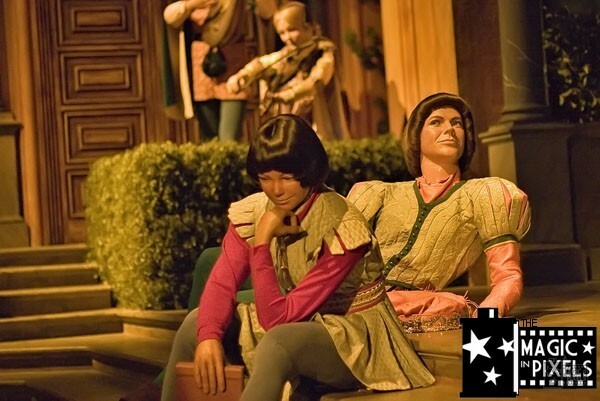 Previous versions of this ride featured someone reading to two people with bowl cuts. If I was a betting’ woman, I would day these two bowl cuts went back in time to Ancient Greece for some re-schooling and fortunately for them, better hair.